Left to right: Pillow Talk, Cami. Since getting my hands on a few bits from Colourpop, I've used something from the line pretty much every time I've worn makeup. The obsession is real! 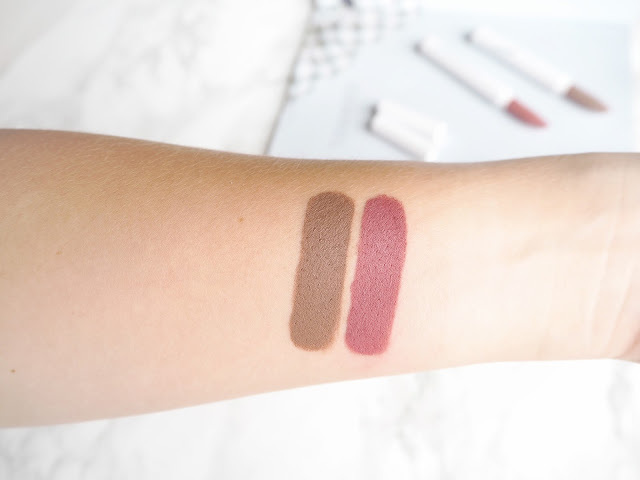 One of the newer additions to their Lippie Stix line is the Matte X formula, which is basically an even more matte finish than the previous Matte Lippie Stix. I picked up two of the shades (it took some serious restraint, the shade range is nothing short of gorgeous) and I've been using both a whole lot since they arrived through my postbox. As I've been road-testing them for a while now, I thought I'd give you a little rundown on the formula, my thoughts and some swatches! The first shade I picked up is Cami, a gorgeous mauve pink shade. I already touched on this in my monthly favourites post last week, but this shade is super versatile. I've worn it both smudged into the lips for more of a stain and fully applied when I'm doing a proper face of makeup. The second shade I got is Pillow Talk, a dark greigey brown, which is right up my street. The formula of these is just absolutely amazing. I remember playing around with them when they first arrived and being completely shocked at just how creamy and pigmented they were when I swatched them. Some very matte formulas are extremely dry and do tug on the lips when you apply them, but there's none of that here. All you have to do is literally touch these to your skin and you already get rich, matte pigmentation. I've worn both shades all day and yes, over time they do get slightly drying, but that is the case with pretty much every matte lipstick I've ever tried and I'd say these dry my lips out less than others in my stash. 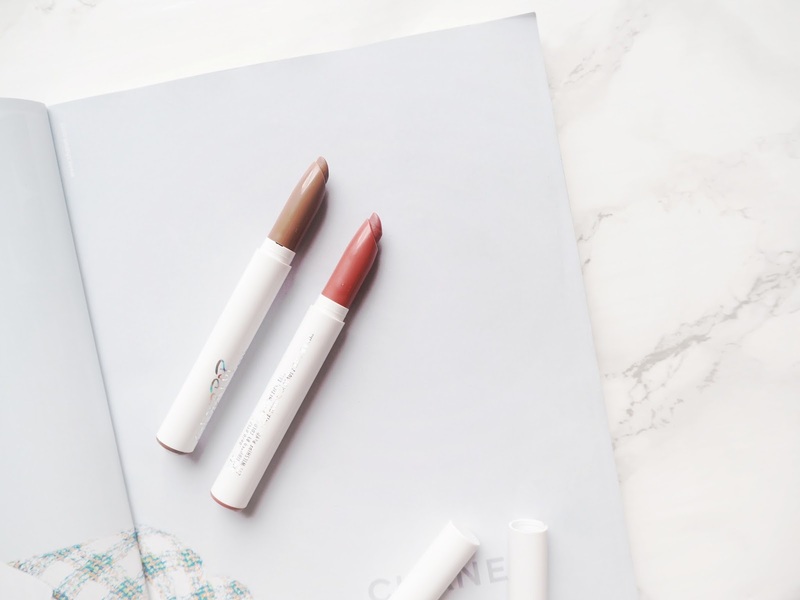 They stay where they are as the day goes on and they're one of the only non-liquid matte lipstick formulas that actually survive meals without ending up on my chin, cheeks and wherever else. Any lipstick that I can wear whilst eating and not have to run to the bathroom right after to reapply is a winner in my books! I think the verdict here is pretty clear! I'm so impressed with the formula of these and how well they wear. The amazing shade selection certainly doesn't hurt either! As per usual, I've been eyeing up a few more, but for now these are my handbag staples! Have you tried any of the shades from this line? Both of those shades are so pretty! These colours are gorgeous! I love Pillow Talk. I have never tried anything from colour pop but they recently tweeted they are going to start doing international shipping so i might have to pick some of these up! Colour Pop liquid lipsticks are so good! I haven't tried these new ones yet but they look great! 'Cami' is probably my favourite one from the two of them! I have to order one of these lippie stix soon. Everyone is raving about the formula. These look absolutely gorgeous! Loved cami, haven't tried the matte x formula but I tried the matte ones and they are great. I heard very good reviews about them. But I don't have any. Actually, I am new in makeup line, so I don't have much idea about them. But, recently I did makeup classes by Lina Cameron , so I need to do practice a lot. I am willing to order some. Can you please suggest me some shades which will suit NC40 well?